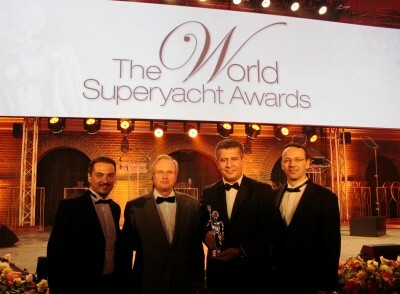 With “Best Concept Yacht under 50m” awarded in 2011 (during construction) and five more awards in 2013- 2014 since launching, the 34m (110 ft) catamaran motor yacht “quaranta” has been the proud winner of six prestigious awards . “We are extremely satisfied and grateful for this enthusiastic endorsement from the superyacht owners, builders and design arenas. The smart thinking and innovation that went into the design of “quaranta” has been very well received”, says van Zanten, the founder of Curvelle. Years of experience in yacht consulting and construction convinced him that a fresh way of thinking was needed to deliver an efficient, cost effective, flexible and more accessible yacht, while maintaining beautiful exterior lines, luxurious and spacious interiors. 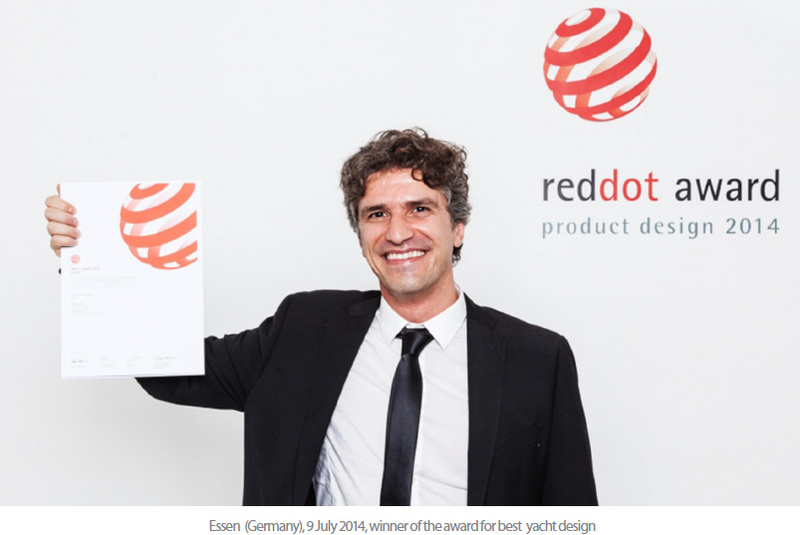 Believing that the catamaran platform offers the key to achieve this, he put together a talented team of designers, naval architects and marine engineers from various continents to produce range of superyacht catamarans with a clear design focus, without re-inventing the wheel, but with attention on producing a very attractive superyacht catamaran. The result speaks for itself and is clearly endorsed by the numerous awards that quaranta has won. This innovative catamaran impressed judges with her many unusual features such as flexible cabin layout, allowing multiple cabin configurations, all guest cabins on the main deck with extra-large windows, stern platform for tender launching, swim/beach platform, reduced mobility access and carbon fibre composite construction. Judges also complimented the exterior styling, spacious deck and interior guest areas and the construction quality. The Golden A' Design Award is a prestigious award given to top 3% percentile designs that have carried out an exemplary level of greatness in design. The designs are judged by a panel of three different juries , composed of Academic, Professional and Focus Group Members.The award is the indicator of quality and perfection in design, and recognized worldwide. Winning the A' Award is a certificate of excellence for designers, a proof of quality for companies. A' Design Award differentiates from any other design competition, design contest and prize by several aspects: The following adjectives are how A Design define themselves: Collaborative, Innovator, Smart, Fair, Scientific, Thoughtful, Munificent, Beneficial, Philanthropic and Beautiful. 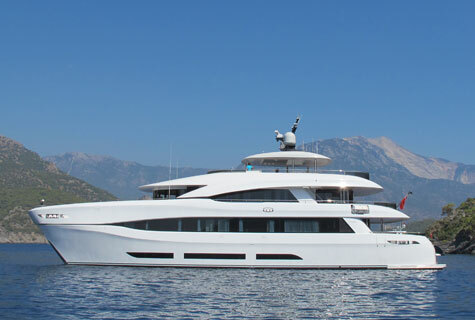 Organized by the Luxmedia, publisher of the international magazines ‘Yachts’ and ‘Invictus’ . The Yachts Magazine Group hosts a glamorous gala dinner during the Cannes Boat Show each year. 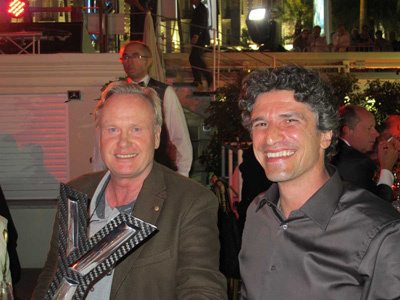 Luuk V. Van Zanten and Mauro Giamboi were proud to receive this prestigious award in front of 750 industry peers at the awards event at the Carlton Beach Hotel, Cannes, a glittering occasion with a yacht parade and fireworks. Turkish Composite Manufacturers Association (TCMA) award Oct 2013 “Most Innovative Composite Marine Product”, Turkey. As the 4th largest shipbuilder worldwide, Turkey delivers numerous composite yachts annually. It is a great honour to be recognized among these as “most innovative” for quaranta’s carbon fibre composite hull and superstructure construction, built in Tulza, Istanbul. Hosted by leading interior design magazine design et al, The International Yacht & Aviation Awards reward the best in design from across the globe. Short listed entries are presented online, and voting is open to industry professionals as well as design et al readers, clients and customers.